Rajitha, Amma to 3 year-old Kavya and newborn Karthik, knows how to make the most of available resources. 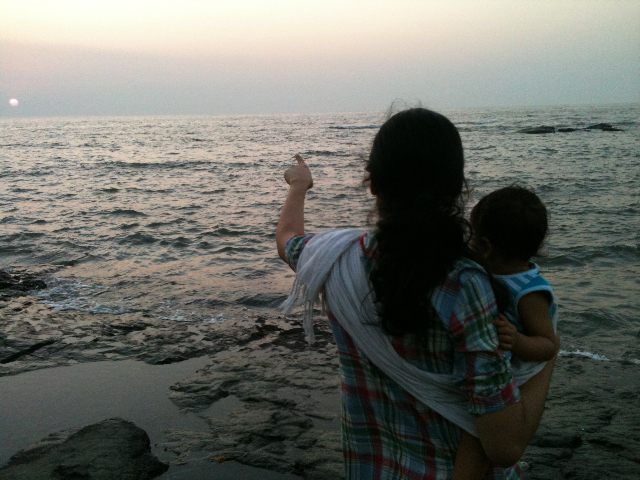 Reminding us of the lovely places to explore in Mumbai, she writes about Parks of Mumbai. You can see her here taking in the sunset with her daughter, who rides along in a simple sling that Rajitha fashioned with sturdy wooden bangles. Unlike any other ring sling I have ever seen, this requires no sewing and you can get it ready to wear in a minute. Here she and Rushabh wear their two little ones, Kavya and Karthik respectively. Make Your Own Ring Sling. In which Rajitha shows how she made her ring sling in just a minute!